With these great and holy words Church pastors usually begin all their sermons, dear brethren. However, on other days these holy words serve only as a preface to church homilies, while on this day they can also form the subject of instruction, since today is the feast day in honor and the glory of the Most-holy, One-in-essence, Life-giving, and Indivisible Trinity. Of what can it be more suitable to speak today than of those Persons Whom we are celebrating? It is naturally difficult to look at the sun, and it is more difficult to look at the Holy Trinity; vision fades, the mind is blinded! In this manner were blinded the heretics Arius, Macedonius, Savellius, Nestorius. Thus become blinded likewise those who try to gaze at the Bright Visage with arrogant eyes. But we will do otherwise: following the example of the godly universal teachers, we will arm our weak vision with the word of God, which, though drawing the spiritual sun towards us, at the same time tempers for us the brilliance of its rays. This method will be the most trustworthy for us, for in the word of God it is the Father Himself, or the Son Himself, or the Holy Spirit Itself that speaks of Himself. Will They not speak of Themselves properly? What then does God’s word reveal to us about God? It reveals that God is One in the very fullness of this word. However, though one in His Essence, God has three Persons. For He is the same Who appeared sole to Moses on Mount Sinai, and Who revealed Himself as triune at the River Jordan, and Who then announced through His Evangelist: “For there are three that bear record in heaven – the Father, The Word, and the Holy Spirit, and these three are one” (1 John 5:7). And the Son of God Himself, when sending out the Apostles to convert the entire world from darkness to light, commanded them to baptize all people in the name of the Father, the Son, and the Holy Spirit. In view of this we have no problem in confessing God both as one and as triune. To accept, worship, and confess the Holy Trinity is our duty, because that is the foundation of our faith, the object of our love, and the pledge of our hope. That is life eternal! For who redeemed us with His blood, if not God the Son? Who sanctified us with His grace, if not God the Holy Spirit? Therefore, in one God we are confessing three – God the Father, God the Son, and God the Holy Spirit. God the Father is so called because, being the source of the entire Divinity, He pre-eternally engendered the Son and likewise pre-eternally produced the Holy Spirit out of Himself. God the Son is so called because from eternity He is born of the Father’s own essence, while in time He, as man, deigned to be born of the Most-holy Virgin Mary. God the Holy Spirit is so called because He is pre-eternally animated by the Father, and Himself animates all creation, particularly reasoning souls. The traits that distinguish the Divine Persons among themselves are already obvious from their very names: God the Father has existed always; God the Son is born, but does not engender and does not produce the Spirit; God the Holy Spirit issues from the Father, but is not engendered and, moreover, does not Himself engender or produce. Fatherhood, filiality, and provenance – the three distinguishing characteristics of the Divine Persons! Differing thus from each other, these three Persons yet comprise one and the same God, one in power, one in will, one in glory and might. In this manner the Church, following the word of God, teaches us about God, teaches us without presuming to have said all that there is to say, nor presuming to have described fully and entirely the Divine being. Not at all! The Church, despite its dignity as the bride of Christ, is far from the audacious thought that it knows all about God and His being. 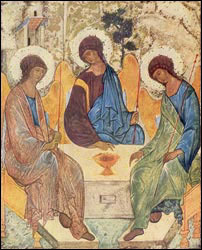 The Church calls the teaching on the Holy Trinity a mystery, i.e. a subject of faith which surpasses our mind, and what surpasses the mind cannot be explained in words, since whatever can be explained in words is no longer a mystery. What is most comprehensible to all in the mystery of faith are the blessings with which each Person of the Holy Trinity has characterized Itself in regard to mankind. There is nothing obscure or perplexing in this aspect of the mystery. God the Father is our greatest Benefactor, for He called us forth out of nothingness, dignified us with His image, did not abandon us even when we fell, but sent His Only-begotten Son to redeem us and His Holy Spirit to sanctify us. God the Son is our greatest benefactor, for after our ill-fated transgression of the paradisiacal commandment, He took upon Himself full responsibility for our sins and the entire burden of our fall. In order to return us to the state of first-created perfection, He clothed Himself in our nature, lived among us, died for us, and arose for our sake. God the Holy Spirit is our greatest Benefactor, for despite His ethereal sanctity He does not disdain us, sinners and iniquitous ones, but enfolds the Church and all that is within it with His grace. By means of the sacraments He revives, fortifies, and heals our souls which have been deadened by sin, enlightens us through the prophets and apostles whom He inspires, and even deigns to reside mysteriously in the soul of each believer, in order to prepare it for resettlement in the eternal abode of the Holy Trinity. In brief, the entire teaching of the word of God concerning the actions of God the Father, the Son, and the Holy Spirit consists of an account of their benevolent deeds towards sinful mankind in various forms. It is precisely against this, the most elevated, comforting, and all-forgiving teaching, that the nearsighted human reason has often rebelled with its pitiful doubts and objections! This same arrogant and boastful reason would like the fullness of Divinity to be revealed to it! However, it is enough to lift just the edge of the veil by pointing to the unity of the three Persons, and already the poor human reason is unable to endure the brilliance of the Holy Trinity. What would happen if the Triune appeared in all His fullness? But let reason look around itself, and it will see triunity in the entire world. Thus, all things exist in time and space, but time is triune: there is past, present, and future. Space is also triune: there is length, width, and height or depth, which is the same. How is the world held together? By the forces of centrifugence, centripetence, and rotation. Of what does each day consist? Of morning, midday, and evening. Of what is each night composed? Of twilight, midnight, and dawn. What do we see in each thing? Form, color, and weight. With all of this and many other manifestations does visible nature express the triunity of the force which summoned it out of nothingness. But if the Divine Trinity shines throughout the entire world, then in man, who was created in the image of God, it is reflected with even greater fullness. Here we see triunity everywhere and in everything, beginning with the visible composition of our nature: our body with its ability to procreate, our soul with its ability to feel, and our spirit with its ability to comprehend lofty and divine concepts. Should we take man’s body – here is a visible triunity of composition: bones, flesh, and secretions. Should we take the soul – there is the same triunity: feelings, concepts, and desires. Should we take the spirit – again there are three: mind, purpose, and free will. In view of such triunity in all of creation, both sensual and spiritual, is not the repudiation of triunity in the One Who exists eternally equal to closing one’s eyes and not seeing the light at midday? Such is the fate of those who, having rejected the guidance of the word of God, entrust themselves only to their poor reason! Wandering from misconception to misconception, they often end up doubting their own existence. Regretting such lack of reason and wishing all doubters enlightenment from above, let us turn, dear brethren, to the subject of our discourse, let our minds soar above all creation, let us draw near to the throne of the Triune. Let us prostrate ourselves in awe before the majesty of His perfection, and as proof of our love and gratitude for all the countless blessings showered upon us by the Most-holy Trinity, let us give to It the gift of our whole being. To God the Father let us offer our body, that it may be a tool for the fulfillment of His holy will. To God the Son let us offer our soul, that it may be inspired by the strength of His Cross. To God the Holy Spirit let us offer our spirit, that it may soar in the celestial realms, flaming from the Spirit’s breath. Blessed is the one who still in this life has already begun, as the Church sings, “to shine with the unity of the Trinity …” Amen.